Third Space Productions, with sponsorship and support from the Community Migrant Resource Centre (Northern Sydney Region), SAHELI/SEVA and NAPCAN are proud to announce the launch of our film, Vatsalayam, an honest and heartwarming exploration of parenting amongst South Asian migrant communities in Australia. Vatsalyam, or ‘parenting love’ is a Malayalam term which encapsulates the special, celebratory relationship that exists between parents, particularly the mother, and the child in South Asian communities. 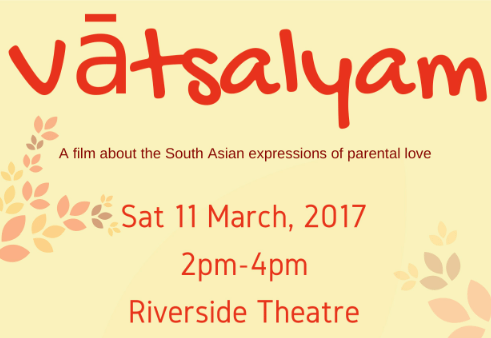 The film directed by Amrit Versha, will be launched during Parramasala, on 11th March 2017 at the Riverside Theatre. Vatsalyam weaves together a collage of stories depicting how South Asian parents and grandparents draw on, and adapt, traditional cultural practices in raising their children in Australia. Led by prominent South Asian academics, community workers and advocates this film has emerged from several years of community development work. In making this film, we show the importance of culture in building stronger families and communities. A message which resonates throughout the film is that the South Asian diaspora in Australia is changing and that migration strongly influences the way children are raised across generations. Whilst South Asian communities share many common rituals and practices that celebrate motherhood and a child’s early years, cross cultural activities around everyday parenting are extremely diverse. Significant celebrations mark milestones and are powerful expressions of love towards both the mother and child. Even in western medicine, there is now a greater acknowledgement of the biological, social and cultural influences on the mother-infant dyad, the role of psychosocial support in the perinatal period, and that early influences on the infant have long lasting consequences for health and wellbeing in later life. Dr Roanna Gonsalves, academic and author of ‘The Permanent Resident’, will launch the film at 2pm on Saturday 11th March 2017 at the Parramatta Riverside Theatre. The film will be followed by a panel discussion with some leading South Asians and followed by a cultural performance.